Enter a Name, Rank, or Medal Number. Or any combination thereof, example: Ship/Unit = Olympia and Rank = Seaman. If a field is not availabe for a given Roll it has no effect if filled in or not. The Typhus Commission Medal was instituted in December 1942, by President Franklin D. Roosevelt when he established the U.S. Typhus Commission. The commission was authorized to work directly with the Armed Forces and Public Health Service to develop a program to typhus fever and also to control typhus in and outside the United States. This medal ceased to be issued after the commission disbanded in the late 1940s. 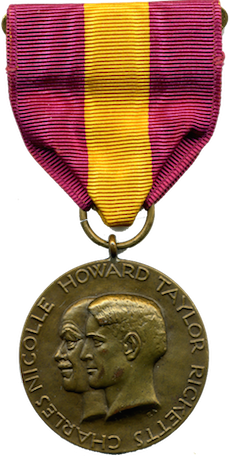 The obverse of the medal has the names of Charles Nicolle and Howard Taylor Ricketts who made significant contributions to the research of typhus. The reverse shows the staff of Aesculapius, the Greek god of healing and medicine with an inscription United States of America Typhus Commmission for Meritorious Service.